Imagine my excitement when I found this on the Disney Family website! But its a reasonable fascimile, yeah???!!! an amazing class presented by Mary Ann Moss. and her love of fuds and cats! LOL!!! So far, I only have the cover done. and played around in my Smashbook! I hear some of you are off tomorrow for Columbus Day. I'll be at work, thinking of you! 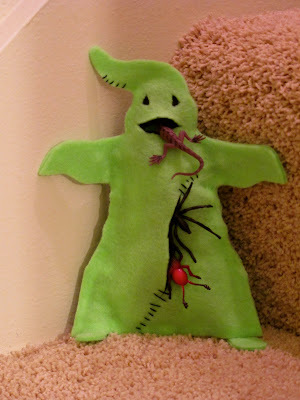 Did you really make the Oogie Boogie Monster?!! Wow, Linda! He came out great...you are awesome! Loving the journal and the ATC cards...so glad you got crafty this weekend! I always LOVE LOVE your creative fabulousness!!! That journal cover is yummy! Such a cute monster Linda! And the cover of your journal is really AWESOME!!! hey!! someone owes me a day off!! your cover is cute in the Japanese arts way, too!